The Cassadaga Lakes Nature Park is a shared vision between the Chautauqua Watershed Conservancy (CWC) and the Cassadaga Lakes Association. The nature park would conserve a 77-acre parcel of undeveloped land with 26 acres of highly important wetlands along Upper Cassadaga Lake. The vision for the nature park is to create a refuge for the wildlife that call the proposed preserve home, as well as a refuge for people to explore and enjoy nature in a beautiful setting. The proposed park includes an all-season trail, an observation tower, an observation blind, fishing dock and picnic area. The beautiful 77-acre parcel, which is located in the Town of Pomfret on Route 60 between Lily Dale and Camp Gross, features mature hemlocks and white pine and 300 feet of frontage on a 5-acre kettle pond with an outlet stream to Upper Cassadaga Lake. It provides important habitat for many water-dependent species, including waterfowl, salamanders, frogs, snakes and birds. 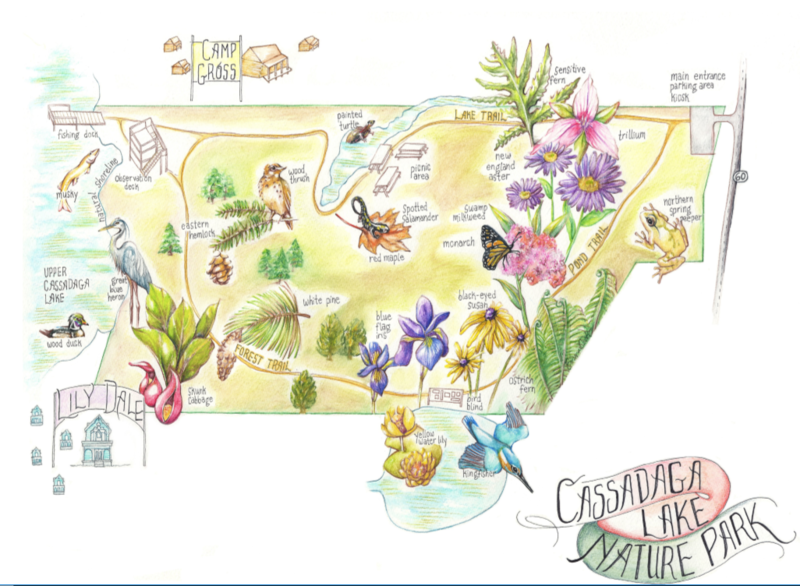 In addition to its value as a natural refuge, the Cassadaga Lakes Nature Park would be crucial in maintaining the health of the Cassadaga Lakes. The wetlands and stream located on the site serve as a filter for runoff draining from 1,800 acres of farmlands and roadways above the site. Permanently preserving the land would help ensure that pollutants are kept from entering the Cassadaga Lakes through the site. The Chautauqua County Parks Commission and  The Town of Pomfret.